If you were trying to understand how a city functions, it would be useful to map not only its streets and buildings, but to identify all of the people in the city and pinpoint their locations at different times throughout the day. That’s pretty much what biologists would like to do for a cell: map an entire living cell in a way that identifies all of its parts and shows their precise locations at various points in time. The challenge has been developing the tools and technologies needed to create such a map. Among those who have risen to that challenge is Alice Ting, an associate professor at the Massachusetts Institute of Technology (MIT), Cambridge, MA, and winner of a 2008 NIH Director’s Pioneer Award and a 2013 NIH Director’s Transformative Research Award. Currently, we can use a fluorescence or electron microscope to take images of a live cell and potentially tag a handful of molecules to determine their location. But this approach captures only a few of the 20,000 or so proteins in a human cell. Alternatively, we can use a technique in which we basically purée a cell and inject the jumbled mix into a device called a mass spectrometer. This method can analyze thousands of proteins simultaneously—but unfortunately it provides no information about where the proteins are located within the cell. Some have tried to extract certain parts of the cell for mass spectrometry analysis, but that approach has proven to be quite difficult and unreliable. 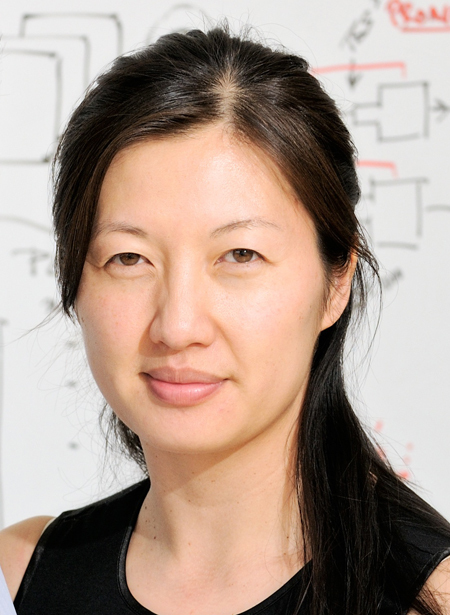 With support from her Pioneer Award, Ting set out to develop a new technique that combines the best spatial capabilities from microscopy with the large-scale protein analysis of mass spectroscopy. The result? A technique with the power to produce a detailed molecular fingerprint of every compartment within the cell. 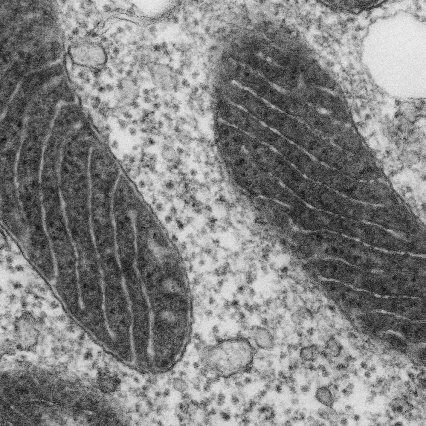 Caption:In this electron microscope image of a mitochondrion, the matrix has been stained with APEX, making it appear dark. The lighter projections into the matrix represent the intermembrane space. Specifically, Ting’s team cleverly engineered cells to produce an enzyme called ascorbate peroxidase (APEX)—but only in the discrete cellular structure they wish to study—a different one for each experiment. To initiate a labeling reaction, they add a molecule called biotin-phenol to the lab media in which the cells are growing. When biotin-phenol migrates into the cell and encounters APEX, the phenol is converted into a reactive molecule, called a radical, which then attaches to any nearby protein. After a minute, researchers stop the chemical reaction and purée the cells. They then use a standard separating device that binds tightly to biotin to extract from the cell mixture only those proteins with biotin labels, which are then injected into the mass spectrometer. The identities of the proteins are revealed by mass spectrometry analysis, and, thanks to the precision of the APEX engineering, their exact location inside the cell is already known. Ting has already made progress in applying her new approach. When her group tested its new system on cellular components called mitochondria, it identified 495 proteins in the innermost compartment of these tiny powerhouses—including 31 that have never been detected there before . Ting plans to repeat this process many different times in many different areas of a cell to generate detailed maps of all the proteins in a living cell at various points in time. One particularly exciting application of this new technology is exploring spaces inside the cell, or even regions outside cells, that can’t be examined easily by current methods. For example, there hasn’t previously been an obvious way to purify the molecules present in the space between the inner and outer membranes of mitochondria. But with Ting’s location-specific APEX enzyme, she’s able to label, collect, and analyze molecules in these previously unexplored areas. The same goes for regions like a synapse—the zone between two communicating nerve cells. If APEX is expressed in the synapse, then, in the presence of biotin phenol, it will label all the proteins present in that synapse (and not elsewhere), while the cell is alive. These labeled proteins can then be harvested to reveal the molecular composition of this zone. Obviously, the APEX technique has the potential to reveal long-sought information about the workings of normal cells. But that’s not all: it could provide us with a transformative tool for analyzing diseased cells in order to discover precisely which proteins are in the wrong place at the wrong time. If you ask Ting why she decided to take on this enormous challenge, she’ll tell you that her father, a geophysicist, had a lot to do with it. Early on, he told her that “being a scientist was the only worthwhile thing to do”—that the point to life was to “find the truth.” And it seems she listened to his advice. She spent her junior and senior year of high school at the Texas Academy of Math and Science, Denton, TX, which is the nation’s first accelerated residential program for gifted teenage math and science students. There, she had the opportunity to take courses in organic chemistry at the University of North Texas. In fact, she did so well that she even began tutoring college students! She also began working in an organic chemistry lab: an experience she found so rewarding, it inspired her to pursue a career in chemistry. When she headed to Massachusetts to enroll in Harvard University, Ting sought out the Nobel Prize-winning organic chemist E.J. Corey and asked if she could work on a project in his lab. As Corey watched the undergrad’s expertise grow, he told her that she “had a mind for methodology”—a talent for developing and perfecting chemical reactions. That observation clicked with Ting. She realized that she had a passion for developing robust techniques and methods that other scientists could use. After leaving the Boston area, she completed her Ph.D. in Peter Schultz’s lab at the Scripps Research Institute, La Jolla, CA, and then went on to the University of California, San Diego for postdoctoral training with another Nobel Prize winner, Roger Tsien, who developed the green fluorescent protein system for labeling proteins. Now, in her own lab at MIT, Ting is certainly excelling at developing innovative methods of her own. If her APEX approach proves successful, we could soon see our first portrait of a living cell with all the molecules in play.